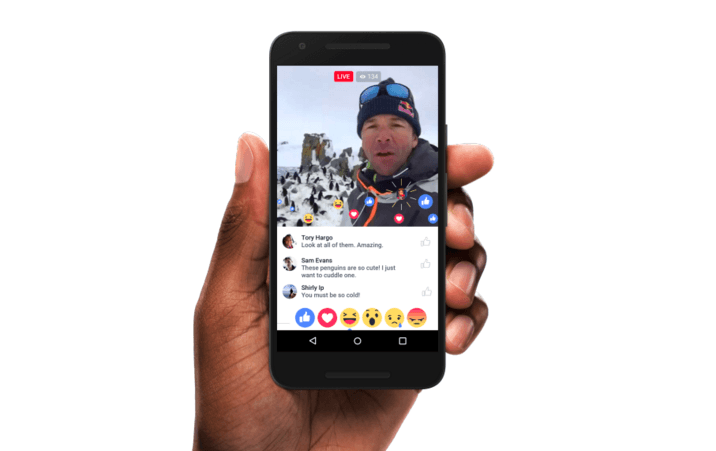 Today, Facebook announced a host of new features for live videos, including the ability to stream within events and groups, add real-time reactions and send invitations to friends direct from the videos, as well as a map of live broadcasts from around the world. In fact, Facebook believes so strongly in its efforts that it has swapped out the Messenger icon on its mobile app for a live video tab instead. The most welcomed change with this update is most likely the ability to live stream within groups and events, which is beneficial for both personal and professional uses. It lets people experience the event from afar, and you have more control over who has access to the stream since it’s not showing on your timeline. Streamers can also improve the video with new filters and doodling tools, akin to Snapchat. New editing features on Facebook Live. Similar to Periscope, you can now react to the stream you’re watching with Facebook’s newly launched reaction emoticons and they will appear on the screen in real time. The reactions also stay on the video for replays. From the new live video tab on mobile, you can look through popular broadcasts – live and recorded – from your friends or people and pages you follow. There’s also a handy ‘go live’ button in case you feel inspired in the spur of the moment. New invite option within live broadcasts. To broaden your horizons even more, the new Facebook Live Map on desktop features streams from 60 countries around the world and every video has an ‘invite’ button so instead of tagging people in the comments section, you can invite them to watch along with you. For publishers, Facebook is also rolling out two new video metrics today. You will now be able to see the number of total live viewers during a broadcast, and a new chart showing the number of concurrent live viewers over time during a broadcast. The social network might not be breaking the boundaries of innovation with its latest features, borrowing filters from Instagram and reactions from Periscope; but by pushing on and being almost obsessive in its promotion of live streaming, there’s every chance it will overtake its rivals any day now. I mean, Facebook has the clear advantage of over a billion users around the globe so it really should be winning this race. The features are rolling out now and should be fully available to everyone in the coming weeks. Facebook CEO Mark Zuckerberg will also be going live at 10:30am PT today to talk about the update and answer questions from the community.